Nigel Shadbolt writes in the Guardian today about ‘A year of data.gov.uk’ and the progress of the last year on open government data (I really need to update my timeline…) and the challenges that are still ahead. However, whilst he recognises that interest in data comes from far beyond just the developer community, the focus remains on “end-user applications”. But, as I argued in my dissertation, it’s not just in applications and things-that-get-built that we will see the impacts of open government data. After conversations yesterday with a current OII MSc student exploring research topics around open data, I’ve been reflecting on where some of those other areas of open data impact worth exploring might be…. How many more citizens might start waving spreadsheets around when they come to talk with their local authority? Pointing out stats from other authorities to help strengthen their claim for particular services, or including a few more numbers when they write to the local paper. No smart visualizations, mash-ups or applications here – just individuals looking to secure better services for themselves picking up facts from newly open data to remove the information-inbalances between them and officials or politicians that has historically kept the balance of power firmly in officialdom’s favor. There are some services based on public data that the market won’t just provide when the data is freely available: or at least – it won’t provide on a consumer-pays model in a way that meets the universal service obligations and responsibilities of public bodies. So public bodies will still need to commission services that are based on data. But what happens when instead of the data being something given exclusively to the person who wins in a tender process, the data is release before, or as part of the tendering process, and the council can choose service offerings off-the-shelf rather than by expensive procurement. Of course, right now bodies often procure data collection, data publishing and data interfaces all in one block (as seems to be the case with Oxfordshires real-time bus information – leading to a roadblock on innovation) – and so without these layers being separated in procurement, some of the benefits here stand to be lost. But tracking how markets structures at the local level – from buying in big services – to buying in other data-related products, such as local planning reports and consultancy, or environmental impact assessments – are affected by an opening of data is, I suspect, a way to find a lot of open data impacts. The idea that open data will bring about an army of ‘armchair auditors’ and crowdsourced scrutiny – and that this, in and of itself – will drive change – seems to miss out on understanding that securing change isn’t simple – and often involves campaigning, political action and negotiation – at local, national and international levels. So instead of looking at the lone-activist with a dataset – what happens when we look at those already involved in cause-based and political-campaigning? How are they using data? Or how will they use data in their campaigns? From small charities with a few staff members, to big campaigning organisations, not forgetting Unions and political parties – how will the change in informational asymmetry between government and advocates shift outcomes. Open data in activism feels like it’s just starting to be explored. In March we’re going to have a day exploring data for campaigners at the annual E-Campaigning forum (more on that over here soon…), and I’ve jotted down a few notes on open data and activism here. But of course, Freedom of Information and campaigning have a long history of association – so understanding how proactive data disclosure impacts on activism (and, looking at whether the proactivity might be somewhat selective from a campaigners perspective) may lead to some interesting understandings of how data impacts on political discussions. In his article, Nigel Shadbolt mentions “ the lack of a common unique identifier for each supplier across government” as on of the current challenges to overcome in building a data infrastructure. What happens as public bodies, and, because of the openness of the indicators, other parts of society, feel pressure to converge on particular sets of identifiers? 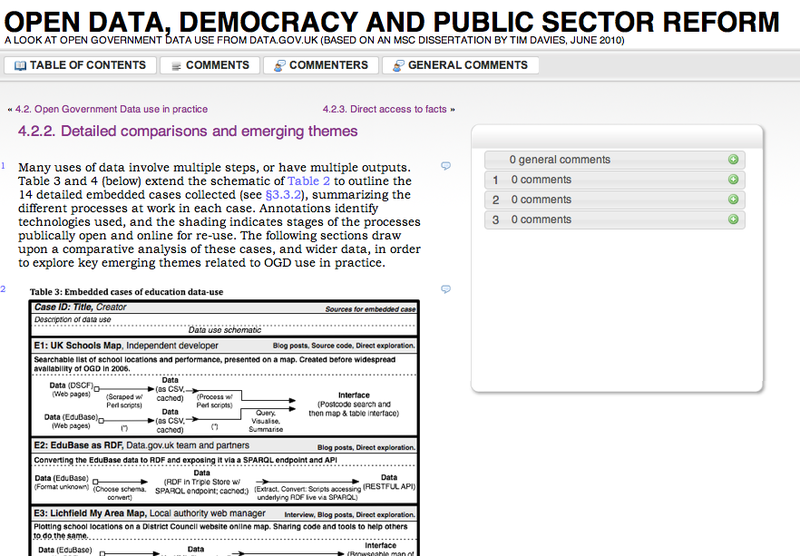 What governance issues emerge with the updating and control of shared indicator lists? How do local subtleties built into data systems get squeezed out? What are benefits do shared identifiers bring? In the recent IKM Workshop on open linked data in international development, questions about the impact of shared identifiers were a hot topic, captured in the second part of the slide-show on the front page here. Standardisation processes have been going on in public bodies for years – but generally through very formal and often heirarchical meetings – open data stands to impact on their development in interesting ways. Of course, the ripples of open government data policy will meet ripples from many other policy agendas (the recent Public Data Corporation announcements look very much like the meeting of some quite different agendas), so the impact of open government data in practice will look very different from impacts in theory. But that’s why attention to how open government data policy and practice unfolds at all these different levels is important – and getting beyond ‘data for developers’, to understand the diverse impacts of open data is a pretty important thing to focus on. 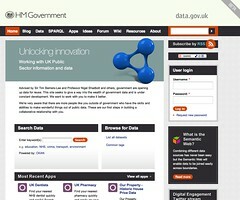 Great to see exploration of other areas that open data impact might be worth exploring. Charity and civil society data is the next port of call for my work.